Frenchman Remy Jullienne says he leaves nothing to chance when risking his life for movie stunts, obviously that's why he chose a Fiat sedan. Being a stunt driver for over 1400 films definitely gives a guy a bit of street cred. Enough so to be commissioned as the stunt driver for a French language remake of Starsky and Hutch, predictably titled "Starsky et Hutch" (this is actually true). Now that's credibility. 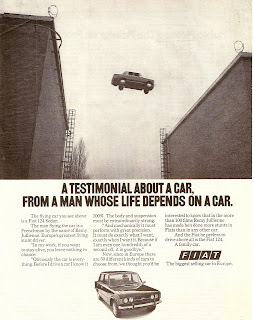 Maybe advertisements like this could make this whole Fiat/Chrysler thing work.